What Neighborhoods Are Best For Affordable Housing? The nation’s acute affordable housing shortage has made the neighborhoods chosen for new projects less important. But where new affordable housing is built within cities matters. Affordable housing in “high opportunity” neighborhoods—- mixed-income communities that offer transit access and cultural and social capital—-can benefit residents far more than if the same project were built in a low-income, low-opportunity neighborhood. Yet building in currently low-opportunity communities is a bulwark against gentrification and displacement. 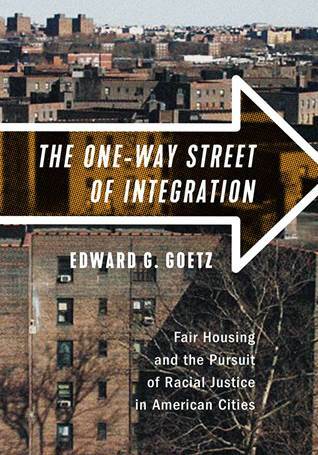 Edward Goetz’s new book, The One Way Street of Integration, examines what the author sees as two contrasting approaches for using affordable housing to further racial justice. Goetz sees a conflict between community development efforts, which support building affordable housing in existing racial minority neighborhoods, and racial justice advocates who want low-income and nonwhite residents to have the opportunity to live in more integrated neighborhoods. Goetz says, “fair housers driven by the impulse to desegregate central city neighborhoods are wary of attempts to preserve affordability in what previously had been low-income communities.” He also that fair housers “may oppose the construction of subsidized housing in these neighborhoods” and cites examples from Dallas, New Jersey and Minneapolis. To be sure, the 1960’s and 1970’s saw raging debates over whether it was better to use affordable housing to promote integration. And Goetz describes these conflicts. But since the suburbs have become less white and poorer and cities whiter and richer, the traditional terms of the affordable housing/racial integration debate have changed. Goetz’s analysis is more relevant today to the critical question of whether cities should target affordable housing to low-income neighborhoods or to middle-class and more affluent areas. Many activists prefer the former strategy in neighborhoods at risk of gentrification. As I describe in my book on San Francisco’s Tenderloin neighborhood, extensive nonprofit building and acquisition of affordable housing helped stop the gentrification that has impacted most of the city. Building affordable housing in at-risk neighborhoods is an essential strategy for preserving economic and racial diversity. Yet in low-income, segregated neighborhoods where gentrification is not a concern, it is easy to understand why housing advocates would want to give low-income residents a chance to live in more integrated communities. Concentrating racial minorities in affordable housing in low-income segregated neighborhoods—-as occurred in Chicago following the destruction of the highrise public housing projects—deprives residents of the improved life opportunities they would get if such housing was in a middle-class, integrated community. While Goetz focuses on the conflicts between community development and fair housing advocates, neighborhood placement of affordable housing is far more often driven by homeowner opposition to such projects. That’s why Austin’s Mayor Steve Adler sought to target increased housing outside the central homeowner districts, even if this contributed to class and economic segregation. It’s also why even “progressive” cities like San Francisco have vast neighborhoods where affordable housing does not get built. Homeowners are the real barrier to the “pursuit of racial justice in American cities” that Goetz seeks. As a Professor at the University of Minnesota, he has no doubt witnessed the homeowner opposition to new rental housing in Minneapolis and St. Paul. For all the attention brought to Richard Rothstein’s The Color of Law, homeowner support for exclusionary zoning that promotes racial and class segregation is as strong as ever. Cities understandably site affordable housing to avoid battles with homeowner groups. Homeowner groups, far more than fair housing advocates, have caused and maintain what Goetz describes as “the one way street of integration.” Fair housing and community development advocates may differ on the best social and racial justice strategies for siting affordable housing, but it is the homeowner groups who all too often are really shaping the decisions. Randy Shaw is Editor of Beyond Chron. He addresses homeowner opposition to housing in his upcoming book, Generation Priced Out, available in October from UC Press.